Among classic car selectors, there’s a suwb-segment of folks who go absolutely crazy for surface rust, handpainted signage, or a combination of the two. And to tell the truth, there is something pretty cool about seeing the history of the truck painted right on the door – it just helps you picture a time when all the working trucks wore handpainted signs on the doors, along with a exchange-style phone number and perhaps the name of a trade that has become obsolete, like, say, radio repair. 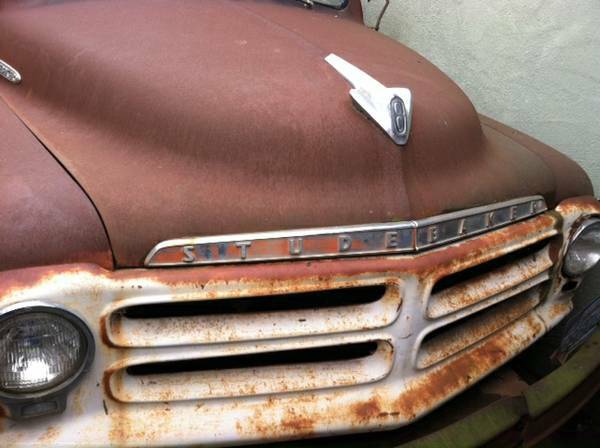 These trucks are still not terribly rare in rural areas, and we’ve got one for you today. 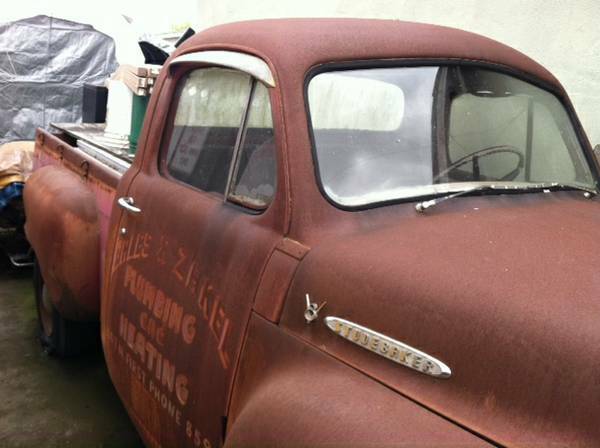 Check out this 1955 Studebaker 1/2 ton pickup, for sale for $2750 in Petaluma, CA. How does this happen? It looks like all the paint (except for the sign) was stripped from the cab, hood and fenders. The body looks reasonably straight, and you can see the truck was used by the Bales & Zakel Plumbing & Heating Company (a quick search turns up an obituary for Paul Zakel, former owner, who passed away in 2010) of Oakdale, CA. The truck is said to have its original 224 V8 engine, along with an automatic transmission. It’s said to have a new wiring harness, along with a newly upholstered seat, though it looks like it’s been sitting for quite a while. The definition of new is different in each seller’s mind, so ask for receipts. There is a transmission in the bed of the truck (along with a California blue license plate), so make sure there’s actually a transmission installed. 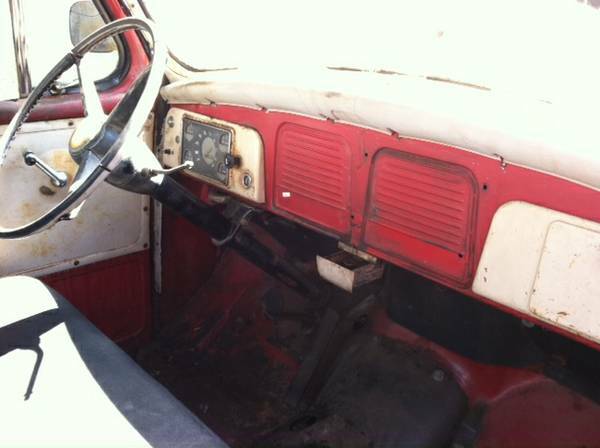 It’s said to have surface rust only, and “no bad metal”, and the odometer shows 65,000 miles. The 224ci Commander V8 puts out 140hp, which should move the truck along swiftly enough. What would you do with retired workhorse? Keep it as is, or restore the body, using the sign as a template for a new one as part of the restoration? This entry was posted on June 20, 2014 at 4:08 pm and is filed under Feature. You can follow any responses to this entry through the RSS 2.0 feed. You can leave a response, or trackback from your own site. Personally, I’ve had just about enough of the Patina crowd. I well remember the over-restored cars of the 70s, 80s, and 90s, but spending $10K for a paint job that looks rust streaks is just nuts. I’d take a picture of both doors (more on that in a minute), find out what colors were offered by Studebaker for their pickups in 1955, and spray on a serviceable coat of enamel (or a single stage urethane that looks like enamel), and then have a professional sign painter (a vanishing breed) redo the door signage in One Shot enamel. I might also think of swapping in a five speed (or maybe an original three-on-the-tree with overdrive) if I’m going to drive it a lot.